We’ve got some great events lined up for November and December. We hope that you join us for these events and bring a friend or two! November Social Event – Come volunteer at Harvesters the evening of Wednesday November 9th from 5:30 p.m. to 8 p.m. As the area’s only food bank, Harvesters is a clearinghouse for the collection and distribution of food and related household products. We will be helping out by sorting food and household goods collected from food drives and donated by the food industry. Plan on arriving between 5:30 and 6:00 pm to grab some dinner before volunteering from 6 p.m. to 8 p.m. Since we will be providing dinner, please let us know if you plan on attending. See additional details/map here: Harvesters Event Information. November Meeting – Join us on Saturday November 12th for our November HLAA-KC meeting at 10:30am at the Plaza Library, the Large Meeting Room. We will announce the presentation topic closer to the date. 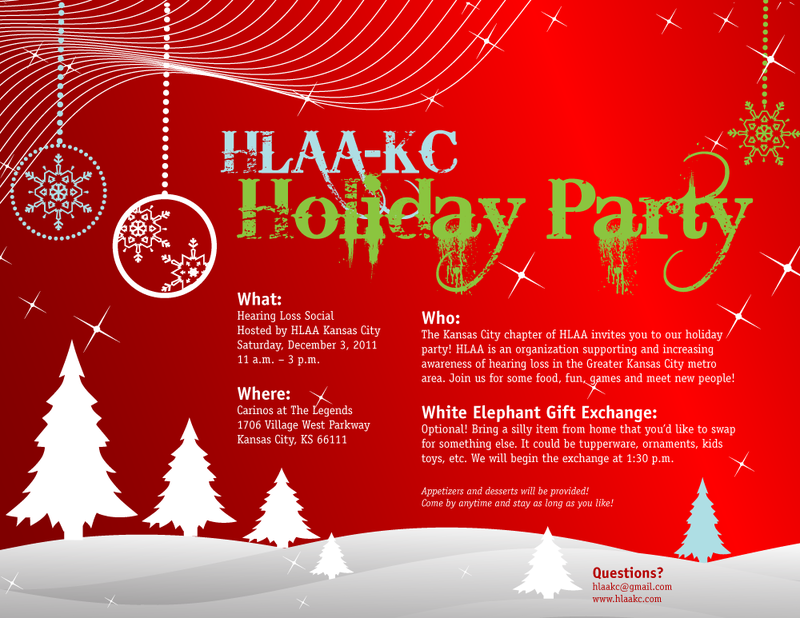 Our annual HLAA-KC Holiday Party will be on Saturday December 3rd from 11 a.m to 3 p.m. at Carinos at the Legends! Consider doing some shopping out at the Legends that day and then stop by to see us. If you have any questions regarding any of the above events email us at hlaakc@gmail.com. This entry was posted in General by Minda Nelson. Bookmark the permalink.